You have to admire a writer who admits to having received over 600 rejections. And who repeatedly confesses that he knows nothing about writing. Bret Lott’s work always strikes me as humble and honest. 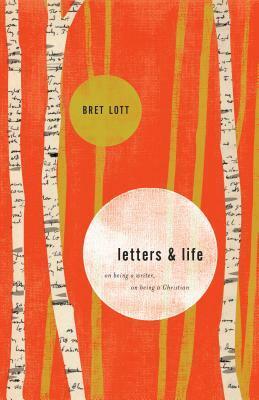 In Letters & Life, those characteristics emanate from his faith and fuse reflections on writing and living into one cohesive book. In the first five essays, Lott explores literary fiction, the public square, precision, the workshop model, and the humility of Flannery O’Conner. The second half of the book is an extended reflection on the death of his father, “At Some Point in the Future, What Has Not Happened Will Be in the Past.” In both parts of the book, Lott looks at his subject with the keen eye of faith as well as the observant eye of the writer. “I tell them that literary fiction is fiction that examines the character of the people involved in the story, and that popular fiction is driven by plot. Whereas popular fiction, I tell them, is meant primarily as a means of escape, one way or another, from this present life, a kind of book equivalent of comfort food, literary fiction confronts us with who we are and makes us look deeply at the human condition” (p. 14). By humbly and honestly sharing his faith-based explorations, Lott leads readers and writers to more authentic living and writing.